Nikki Sharp is a best-selling author, wellness expert, and the creator of the #1 app, The 5-Day Detox. Since creating her lifestyle brand under her own name, Nikki has gained nearly half a million followers, and has become verified on the top three biggest platforms including Instagram, Facebook and Twitter. She can be seen giving health tips on national shows such as Access Hollywood, Extra TV, Good Day LA, and is frequently featured in magazines and online components. 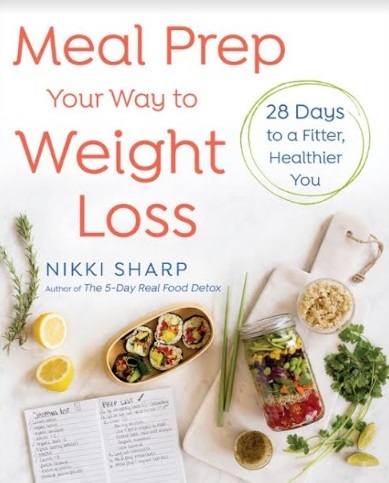 Meal Prep Your Way to Weight Loss shares Nikki’s secrets and shortcuts for creating a week’s worth of healthy, plant-based foods designed to help you not only lose weight, but keep it off! Loaded with beautiful images, specific grocery shopping lists, and delicious recipes it teaches sustainable, clean eating, while saving time and money. Nikki shares her health-altering meal prep system and her favorite super meals (infused with ultra-nutrition in every bite). Going with the flow and not allowing things to bring me down or get to me. I no longer get crazy upset if something doesn’t go as planned, nor do I bat an eyelid if there is traffic. I am told often how much others notice this quality in me. My tenacity. I’ve had an incredible amount of “no’s” in my career and every time I get told I can’t do something, or my mind momentarily believes it, I power forward. I’ve accomplished nearly every single thing I have wanted to. A huge personal goal that I have (which is in plan) is to be based out of Paris, Bali and Los Angeles. I’ve traveled the world and have found that these three places feel like home for me, so why decide on just one? :) And a business goal is to eventually own a restaurant and to work with congress to improve school lunches for kids. Oh gosh! This is hard to choose because I’m so proud of many different things in my life. I’m proud of everything from my meditation practice, to overcoming two eating disorders, to signing a 2-book deal with Random House. All of these are huge successes! This book launch has been quite challenging in general because things have not been flowing as smoothly as I planned or hoped. What I’ve learned is to let go of what I believe should happen, accept what does, and adjust my sails as necessary. I call it a Plot Twist. It’s really shown me how much my meditation practice is in effect and the beauty that it’s had on my life. Never judge others because you never know what they are going through. This is a motto because we are all going through something at any given point and you never know how others handle stress, heartbreak, or anger. Showing love to all beings is the universal law to create a happier life for yourself. I’ve always looked up to Oprah (And hope to meet her one day) because I’m so in awe of what she’s created while being authentic to herself, her audience, what she’s helped create. Amalfi coast is one of my favorite places on earth, along with hiking in Wanaka, New Zealand, and sunsets in Mykonos + Santorini, Greece. I love my Vitamix because it does everything in the kitchen (although I’d love to try a thermomix) and I also love my passport… because it takes me all over the world. Oh, and Global Entry because it’s necessary when traveling back to the US! Travel! I’m so excited to travel extensively this upcoming summer to learn about new cultures and to take a step away from work for a bit. The book launch was very intense so now I get to take a step back, go into learning mode and just explore life.